The next Grand Canyon hike starts in a little over 2 weeks. Every one of these I do teaches me another lesson. This year’s lesson seems to be about food. For the last hike, I had discovered a book called “Backpack Gourmet,” which I used to make several suppers. The food was spectacularly good, and there was plenty of it. So this time I used the recipes in the book to make all our suppers. Part of the process involved dehydrating the food. 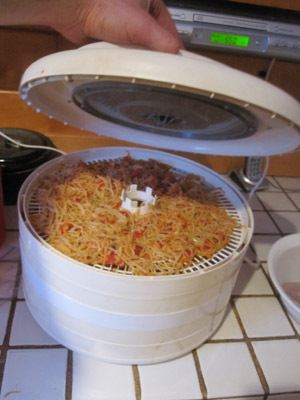 The picture shows the dehydrator in action with our spaghetti meal. Another lesson I learned last time involved the weight of food. My luggage was over weight at the airline, which cost me an extra $90 on the outbound part of the journey. This time I made the food up a couple of weeks early, and shipped it via UPS. I sent it out this morning, and felt a real sense of relief. The night before the hike, Steve and I are staying at the Maswik Lodge on the South Rim. They offer the service to guests of storing a package for you that can be claimed on arrival. I wonder if I’ll get money back from the airline if my luggage is under weight? 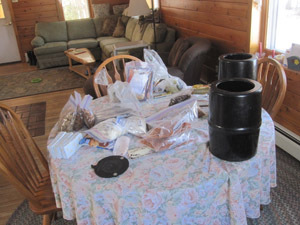 The black cylinders in the picture are “bear canisters,” into which I pack the food. They are designed to make your food impossible for bears to get, although they work equally well against ground squirrels and ravens; two dedicated food snatchers in the canyon. Conditioning for the hike is also going well. I’ve been carrying my backpack with a 50# sack of sand in it for months now just about every day. This in addition to my normal morning exercises, and the normal activity of my day. After all the hikes I’ve done, I’m not very worried about my muscles, but the joints are another question. I plan to take it very easy, especially on the downhill portions. With care, I think this will be a spectacular hike. This entry was posted on Tuesday, February 14th, 2012 at 9:20 pm and is filed under Uncategorized. You can follow any responses to this entry through the RSS 2.0 feed. You can leave a response, or trackback from your own site.